The second baby quilt is all finished up and I will share a picture as soon as it is delivered. The recipient reads this blog and I don't want to ruin the surprise! 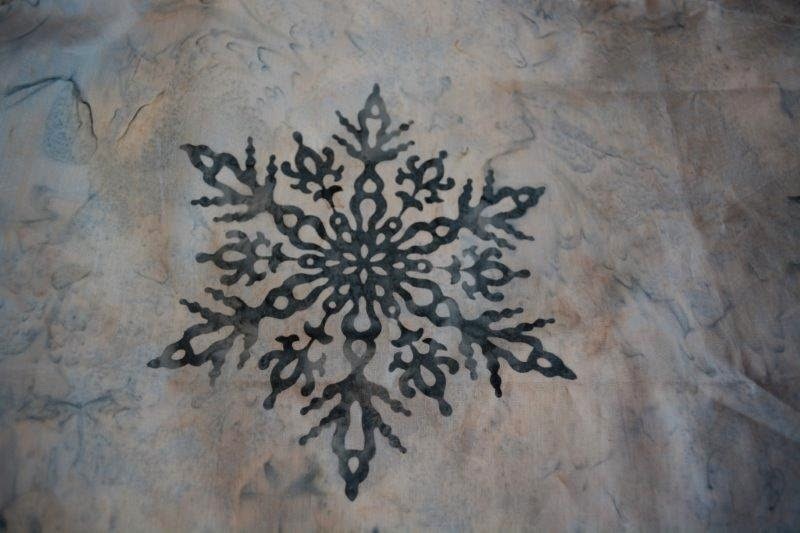 I was itching to play with the Hoffman Bali snowflakes that arrived last week (see previous post). 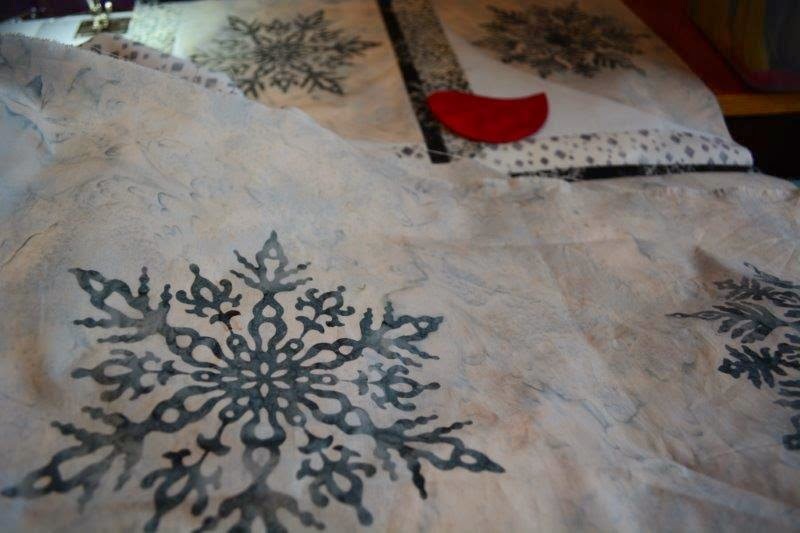 There were a couple of colourways included to choose from; I decided to start with the grey/silver snowflakes. They captured the mood and colours of last week's blizzard perfectly. Hoffman batiks are a dream to sew. I am piecing with 50 weight cotton thread (Wonderfil Konfetti) and a Microtex needle 80/12 in the machine. All that's required is a hot, dry iron and the patchwork comes out perfectly flat and square. 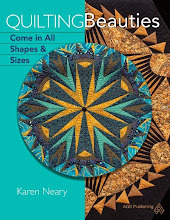 When it comes time to quilt I will switch my needle to a Metallic 80/12. 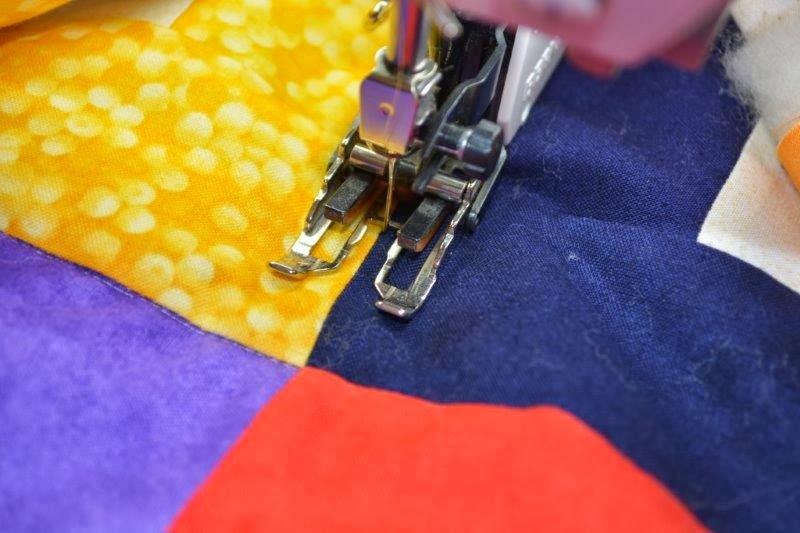 With regular quilting cottons, I would probably use a 90/14 for the quilting, but with the higher thread count of the batiks a larger needle sometimes makes a visible hole where it punctures the cotton. Mrs. Pugsley's Emporium got a nice selection of Schmetz needles in this week and it's heaven to have such a fabulous choice available locally. You can see I am auditioning a little pop of cardinal to brighten up the snowy palette. My inner duck has been drifting quietly on the surface...but my feet have been paddling like crazy underneath. 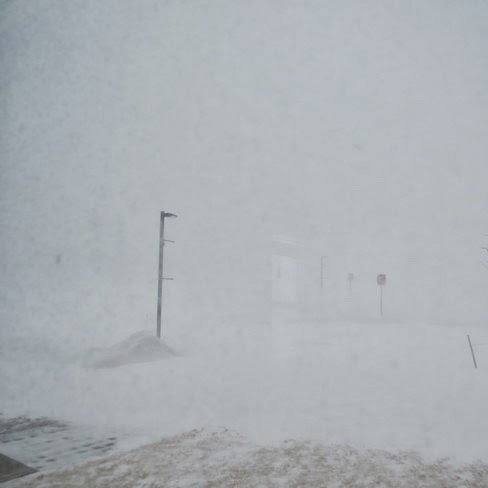 We had another blizzard, which brought hurricane force winds (recorded at over 200 kms/hour in Cape Breton!) and more than 40 cm of snow. To add to the excitement, in the middle of this we needed to make a run to the airport, and hosted house guests. Fortunately, we had enough shovels to go around! 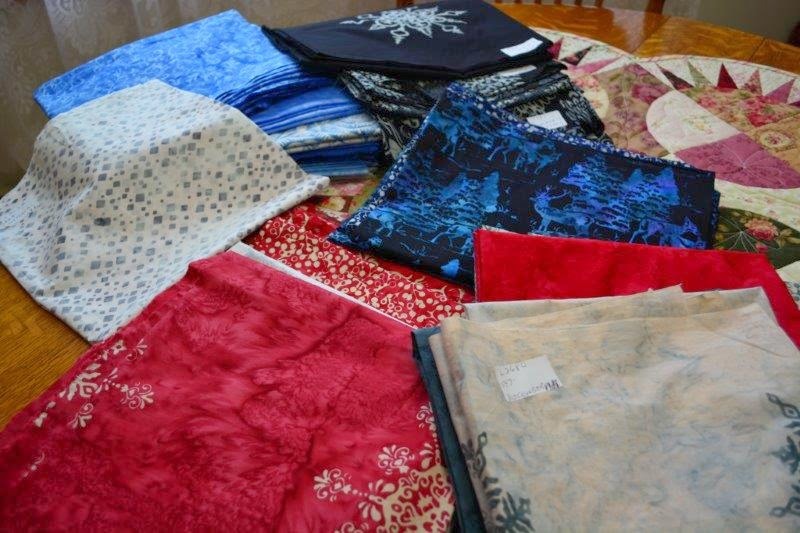 A big batch of beautiful batiks arrived. The motifs they are sporting are perfect for the occasion. I hope I can get them sewn before the snow leaves to get some nice outside shots. Isn't this gorgeous? It's beyond exciting. There are still a few months between now and actually holding this new baby in my hands but it's been a huge feeling of satisfaction to see things this far along. I am off to sew. The second of my baby quilts stalled out during all the hoopla of the week but it will be finished soon to show you. Hope on over to Kate's blog to see her very pretty finished version of Polly's Posies. Thanks for sharing, Kate! 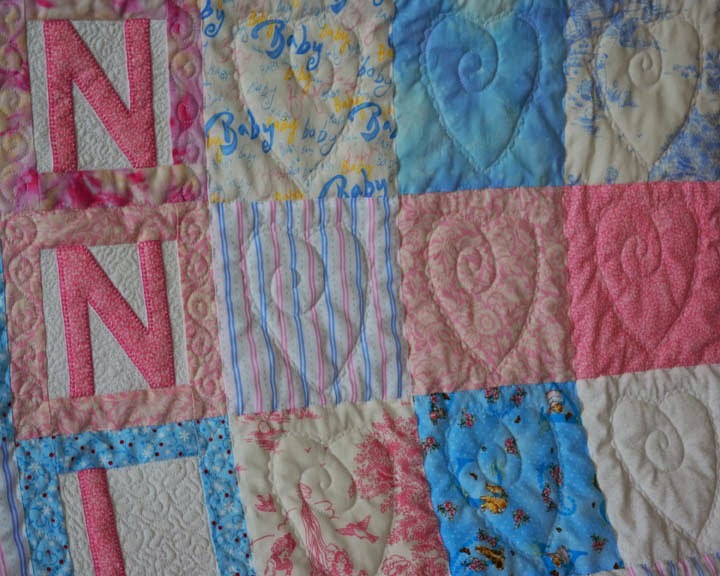 The first baby quilt is all done and will be delivered this afternoon. 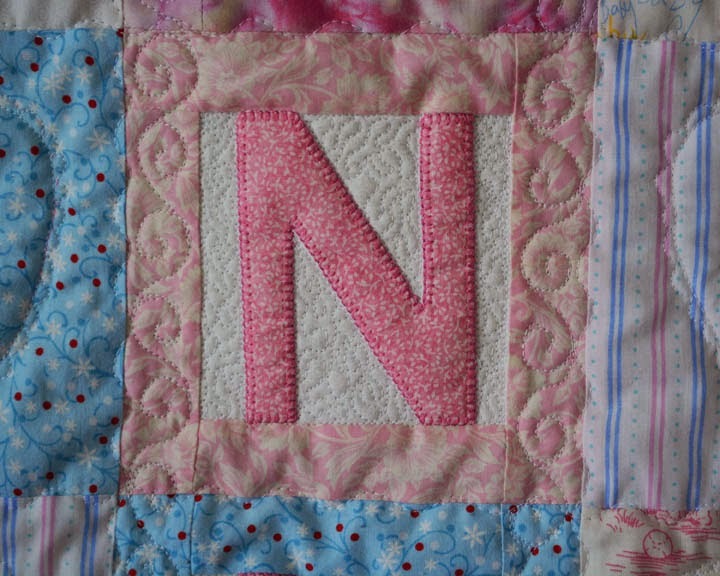 I used the letters from the Quilt Of Learning pattern to spell out the recipient's name. The rest is simply plain squares of pastel pink, blue and white. When a name is so unique, I always think a personalized gift is extra special. 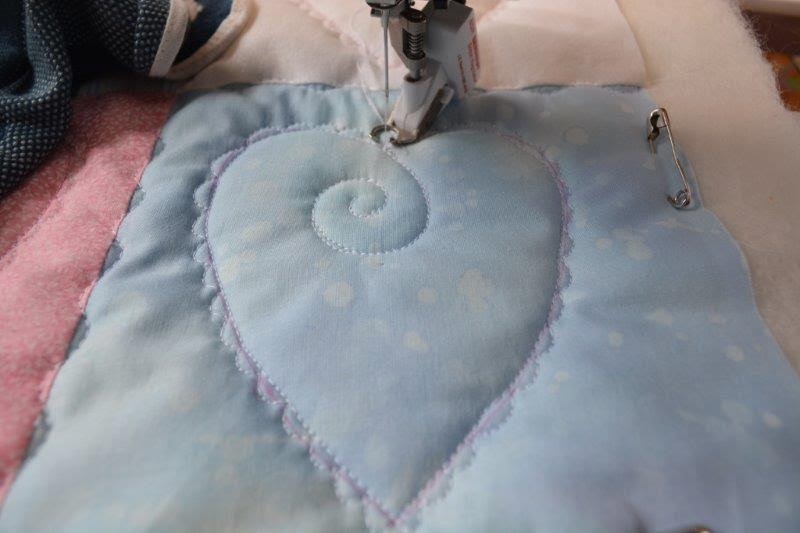 As I showed in the last post, I put a little scroll inside each heart - some curled to the left and some to the right. 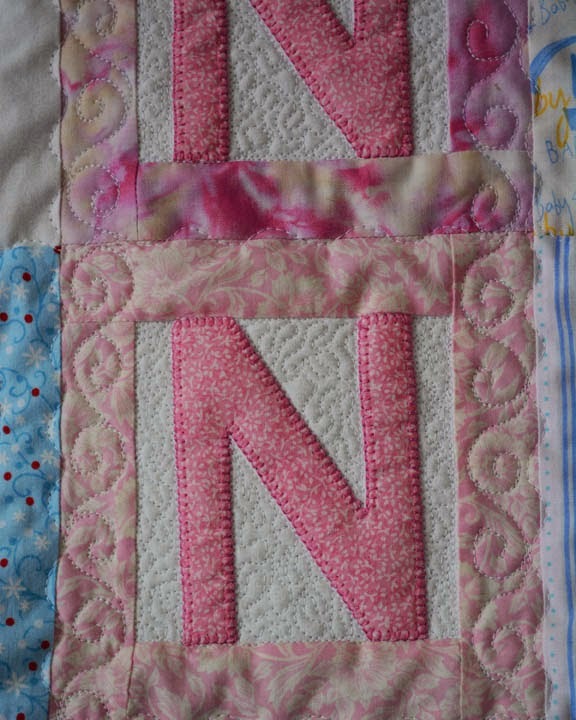 I also stitched scrolls running up the length of the quilt in the strips framing the letters. 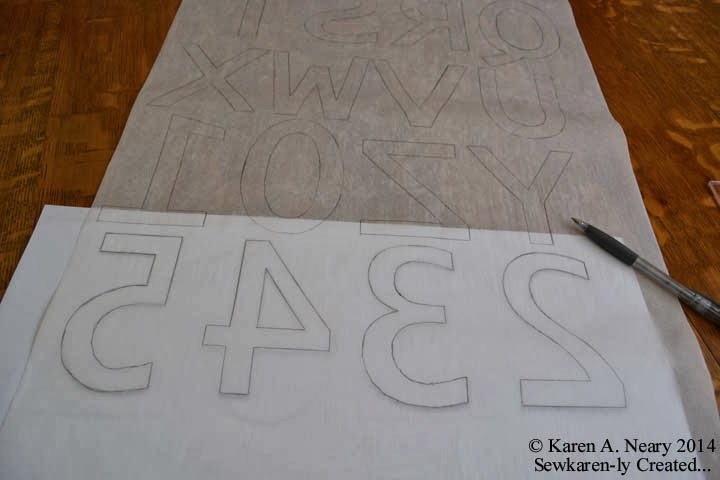 The letters themselves were free-motion outlined; the background was stippled to make the letters stand out. On the back is a soft blue and white check flannel. Everything was from stash other than the pink for the binding which came from Mrs. Pugsley's. Emporium. 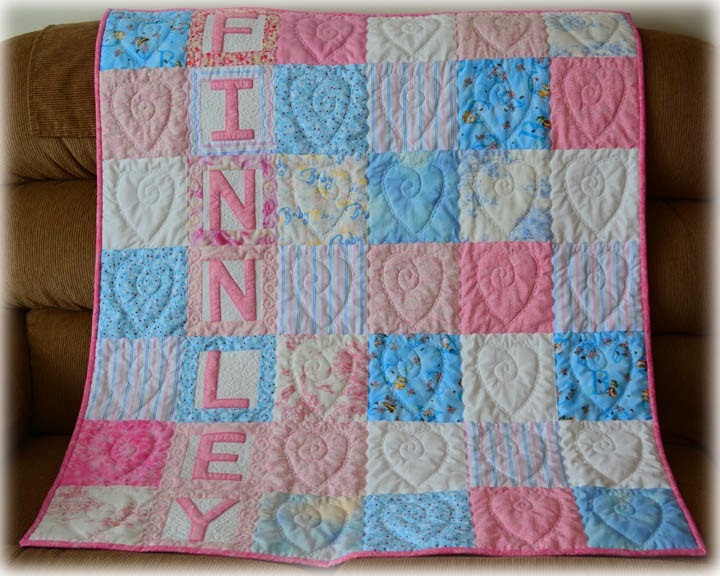 I chose pink as the quilt is for a little girl. Now on to the next one, which will be made using brights. It will have a very different "personality." 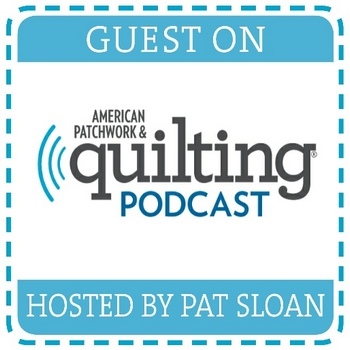 When you quilt as a business, what do you do in your spare time as a hobby? Quilt, of course! While waiting for more fabric to arrive, I took the opportunity to stitch together a couple of baby quilts, for gifts to friends. 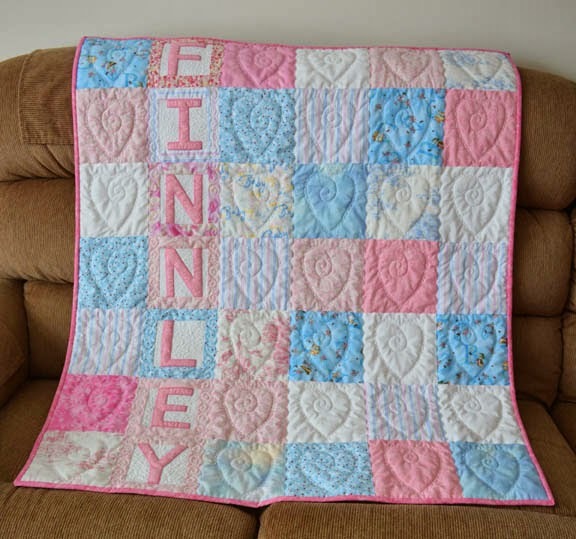 These are simple, no pressure quilts - soft, pretty, and meant to be used and loved. 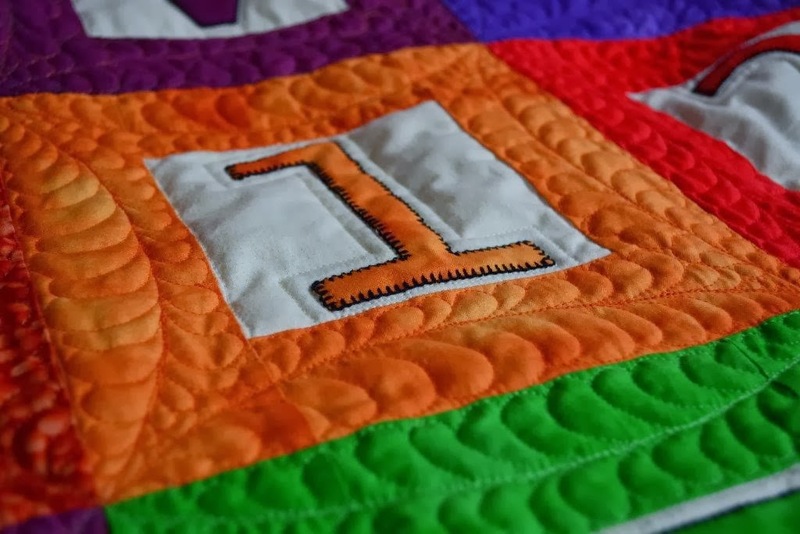 Saturday was World Wide Quilting Day and today I understand (in addition to it being the first day of spring) is International Day of Happiness. 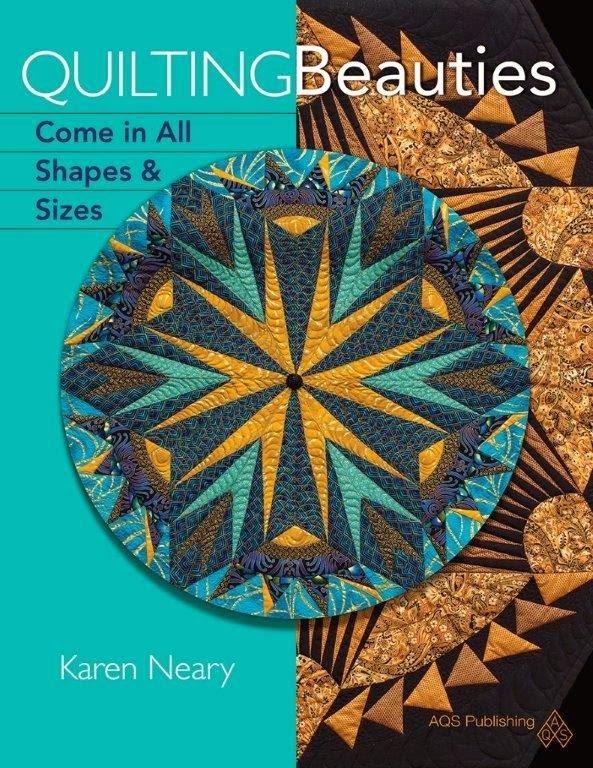 For me it's all the same, and all about quilting. How Zen. 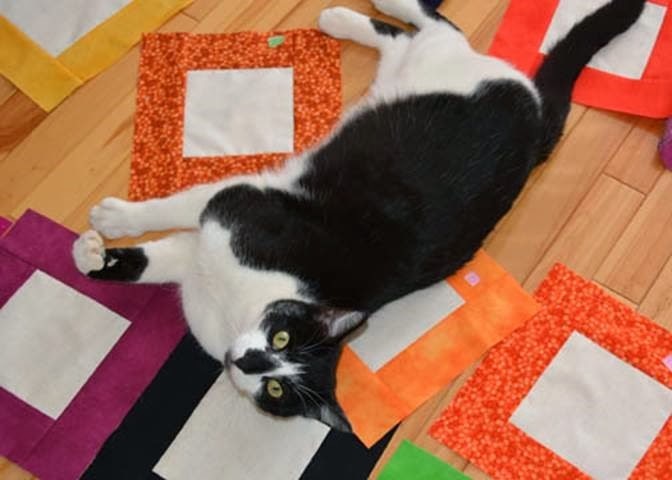 Every colour of the rainbow is included in the "Brights" selection of pre-cuts and it was a snap to put together this very simple quilt. 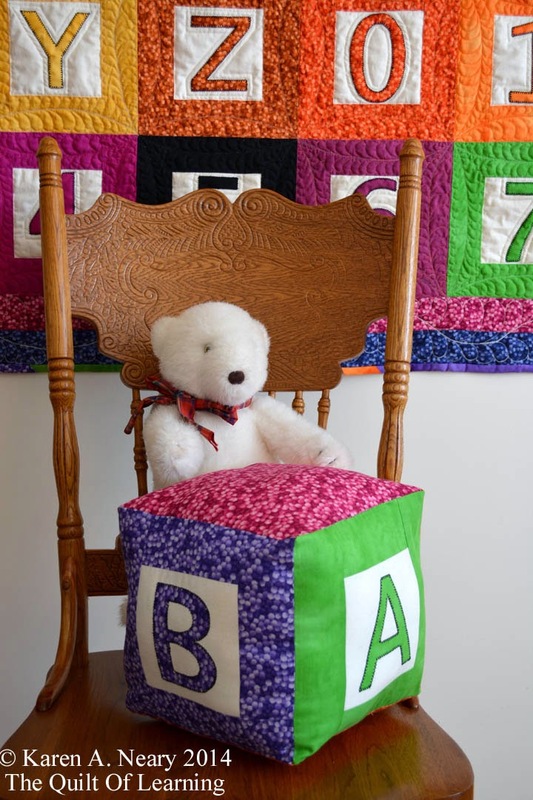 The extra large size (54" x 62") allows the quilt to grow with the child, and is a great size for a lap quilt, or a nap quilt to take to Nana's. 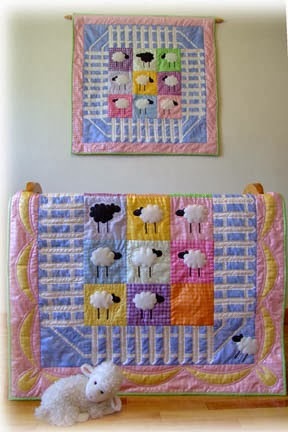 If you added a border, the quilt could easily be made to fit a twin bed. 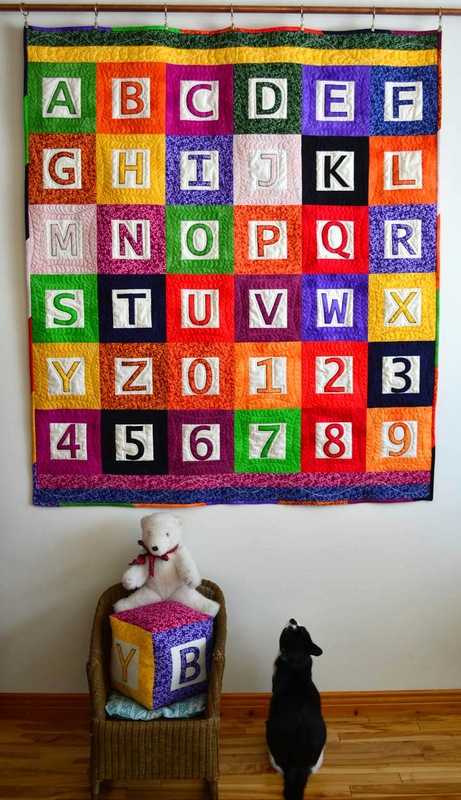 The pattern includes all the letters and numbers full sized and already reversed for tracing directly onto the fusible web.It couldn't be easier! There was fabric enough to make this matching big-block pillow, which is shown here on an antique wicker rocker from the 1920's. It belonged to my Mom. 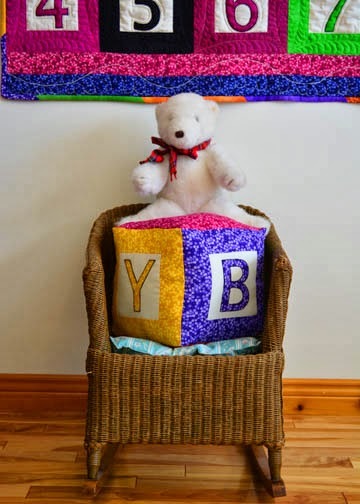 I chose letters to spell BABY but it could easily be personalized with your child's name or initials. The pillow itself would make a fun baby gift. 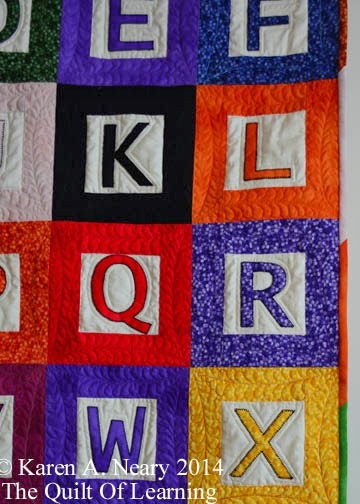 I named this piece The Quilt Of Learning because that's what it's all about. 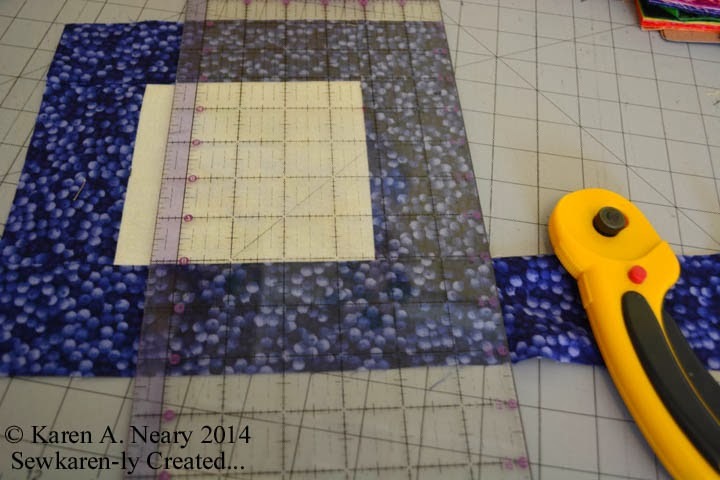 working with pre-cuts is totally painless (brainless!) and a big time saver. the Maple Roll strips are a perfect width for French-fold double binding - so nice to have the binding all cut and ready to sew. The strips from Trend-Tex are laser cut with smooth edges, not pinked, so they are not linty like some of the other pre-cuts on the market. That's important for those of us who have issues with cotton allergies...It also meant my machine was not clogged with fibres. that I have a huge thread stash including many bright colours ...except yellow. My only yellow on hand was a pale, straw colour (which actually looked fine on the block). I will be shopping for yellow threads! I used my favourite wool batting and did a continuous curve around each letter, then feathered the curve. This makes for a nice puffy, cuddly quilt. 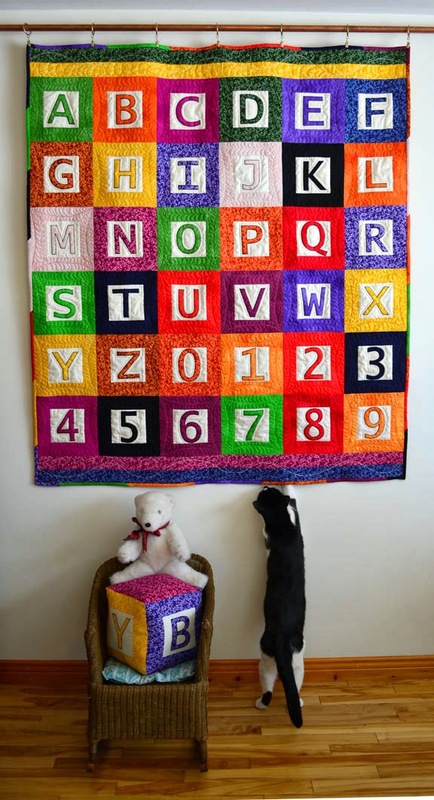 I outlined each letter using a machine blanket stitch and black thread to make them stand out. Leftover strips were joined end to end to make the rainbow binding. Maddie was quite taken with the quilt...but I am not sure what he learned from it. Surprisingly, the bear didn't interest him at all. Some time ago I designed and released this pattern for a sweet nursery set. I named it "Yan Tan Tethera" after an olde English sheep counting rhyme used to lull little ones to sleep (from where we get our "counting sheep"). 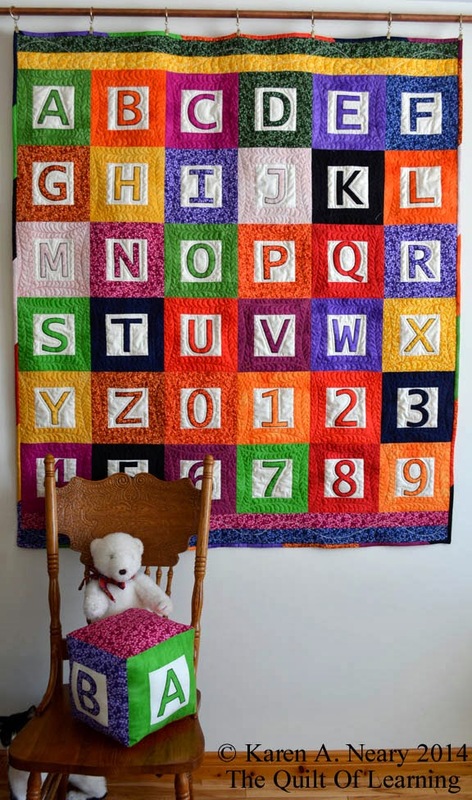 It's always been a good seller but lately, through Pinterest, there has been a resurgence in interest and the quilt is pinned on a great many boards. 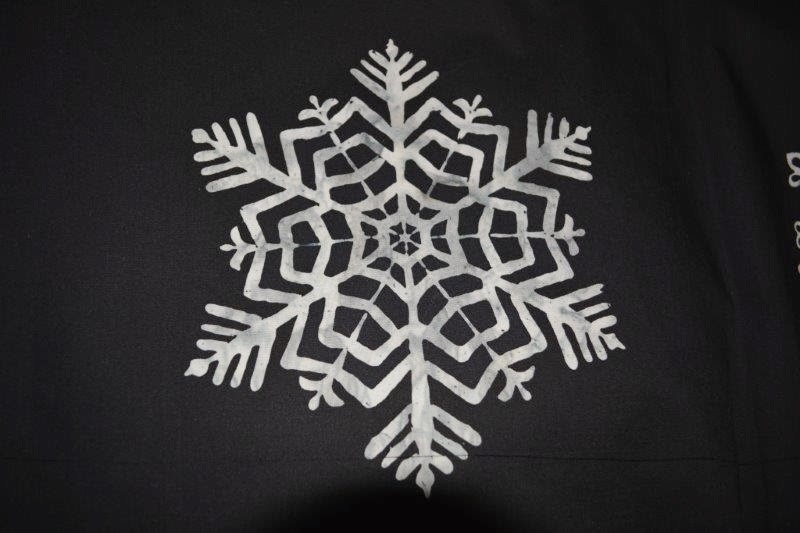 Due to popular demand, I have reformatted the instructions and they are now available for instant download on Craftsy. The set is pieced using Michael Miller Fairy Frost and Mirror Ball Dot; it was my first introduction to these fabrics and to the talent of Mark Hordyszynski, their designer. It was especially fun to use the Glow In The Dark cotton for the sheep; it really works! When the lights go out, the sheep remain visible in the dark. This fabric isn't always easy to find, but it is available and in stock at Mrs Pugsley's Emporium. 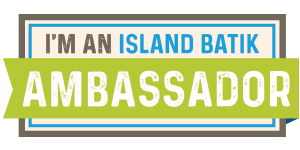 Mrs. P.'s does mail order; an email will get you the details! 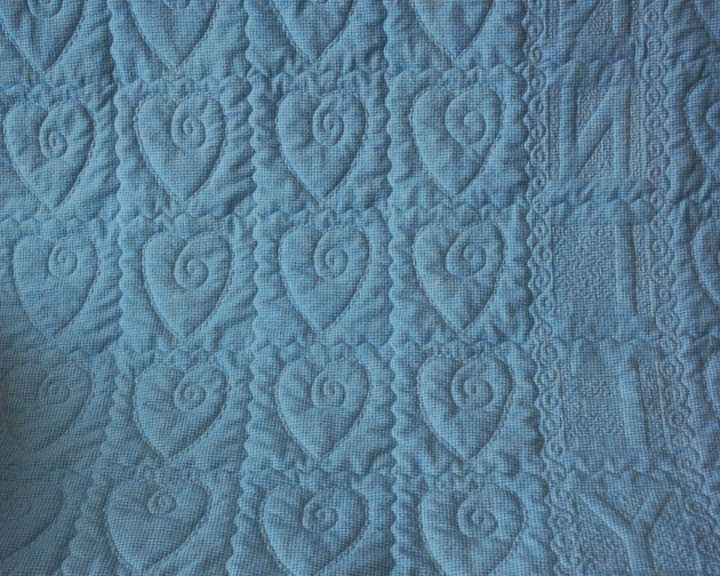 Here's a sneak peek at the quilt I am making from the Maple Rolls and Maple Cakes. There are a few loose (thread) ends to tie up yet and then I'll show the complete set. What a pleasure to work with such bright, happy colours! 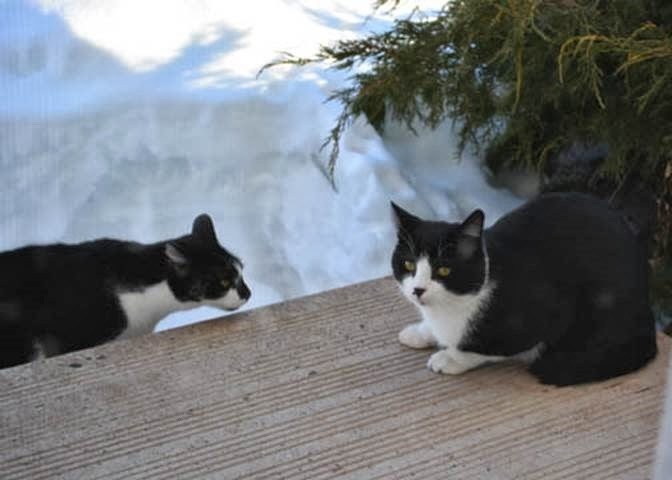 In my previous post, I mentioned we were away a few days; the cats were left in the care of our eldest son whom both cats adore. When we returned, Maddie was sitting in the big front window watching for us. 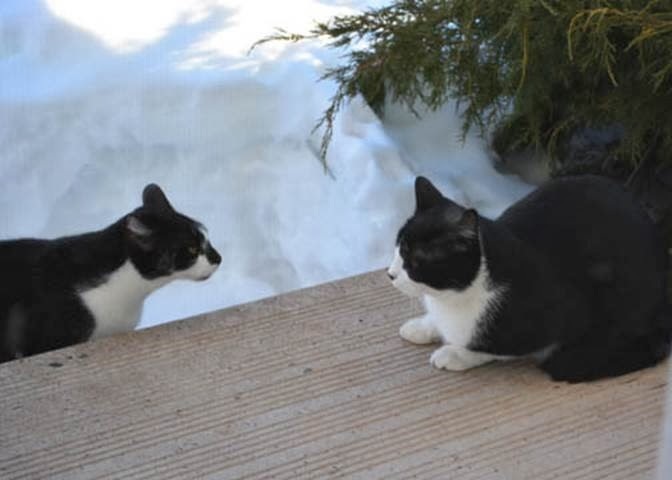 After time for greeting both he and Polly, we checked the phone messages and found one from our cat-loving neighbour, quite late the previous night, saying that Maddie was crying at her back door and she wondered if we knew he was out. 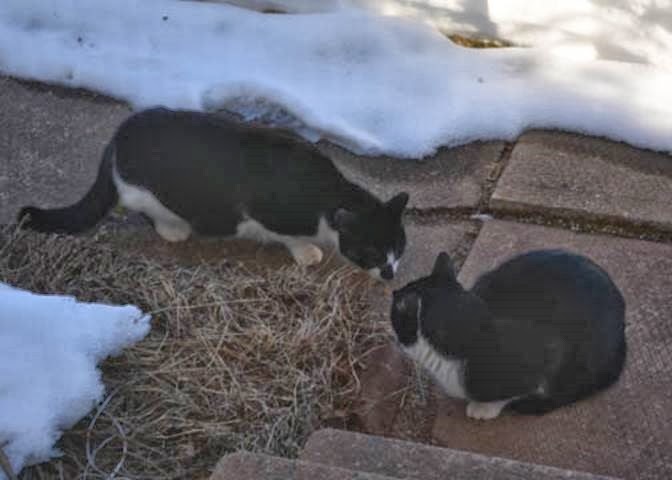 She had tried several times to get him to come inside (because it was -20) but he wouldn't. This sounded odd for a couple of reasons (one of which is that Maddie never cries, he is a silent cat.). I contacted my son to ask if Maddie had escaped one night but he assured me neither cat had been outside the whole time we were away. We knew immediately what was going on! For the last little bit there has been a Maddie look alike hanging around. 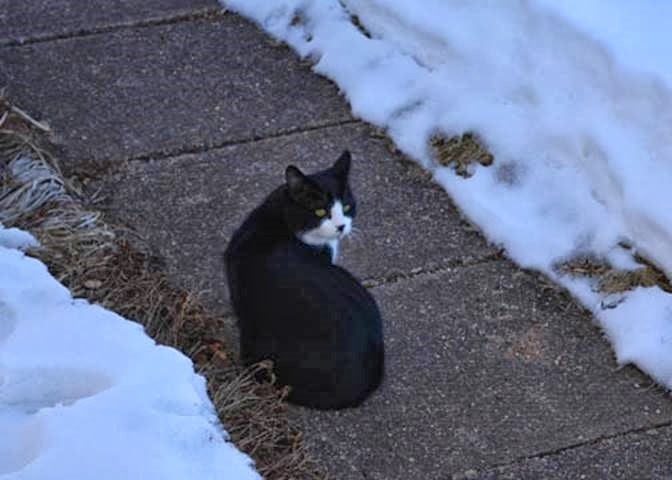 We've seen him outside and tried to call him in thinking he was our cat, only to look down to find Maddie at our feet. They look so much alike, it's hard for us to recognize our own child! Here are the two of them together. Their tuxedos must have been made by the same tailor as the cut and colouring is almost an exact copy. They have the same bouncy gait. Impostor Maddie even has the same sleek, shiny, thick fur as our Maddie. 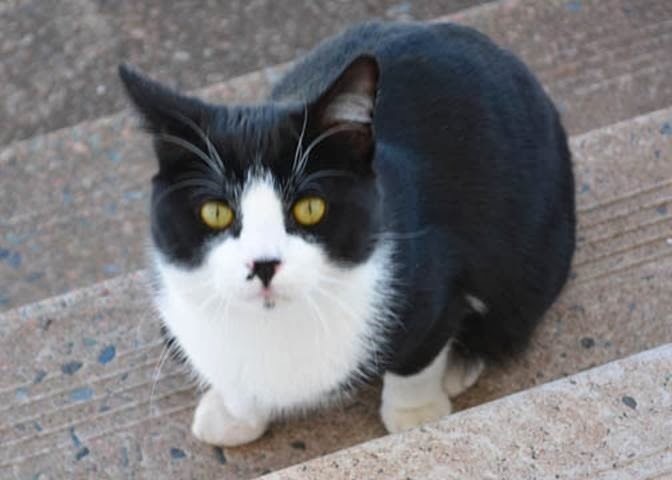 We know he has a home - he is very well cared for - not far from here. We do wonder if they are brothers? We think it's very funny. And yes, we have great neighbours! 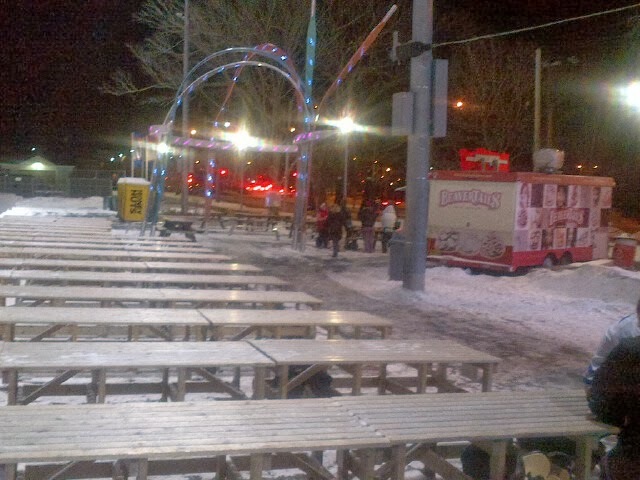 Despite the temperature being in the -20's (plus a windchill to make it worse!) it was very enjoyable. A funny thing took place here while we were gone which I will tell you about as soon as I get myself caught up a bit (it's a cat story of course!) The past two weeks have been wonderful but have put me way off schedule with work. 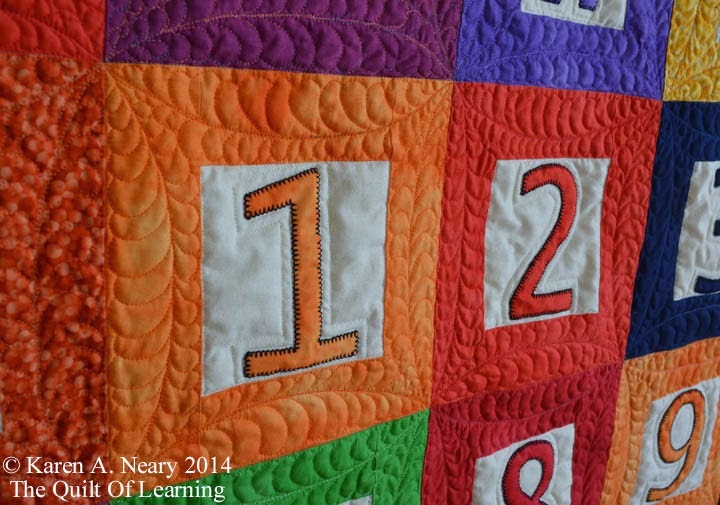 I am finishing up the Quilt Of Learning and hope to show that to you soon. As last week was Spring Break at my son's university, it was pretty much a wash for work. We always take the week for family vacation and even though we don't travel any place warm or exotic, we do enjoy spending time together and catching up on each others lives. Spring Break always feels a bit like Christmas with everyone home (we even had a turkey!) Having said that, I did take the odd minute here and there to work on the blocks which went together very quickly. I even got a start on the fusible appliqué. 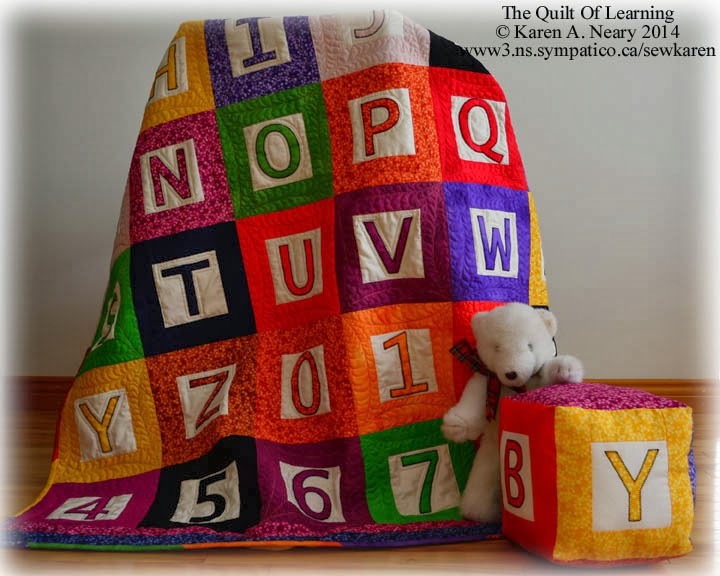 It is a fun, colourful quilt and I have learned a lot in the making...so much so in fact that I think I will name it The Quilt Of Learning. Pictures to follow soon!